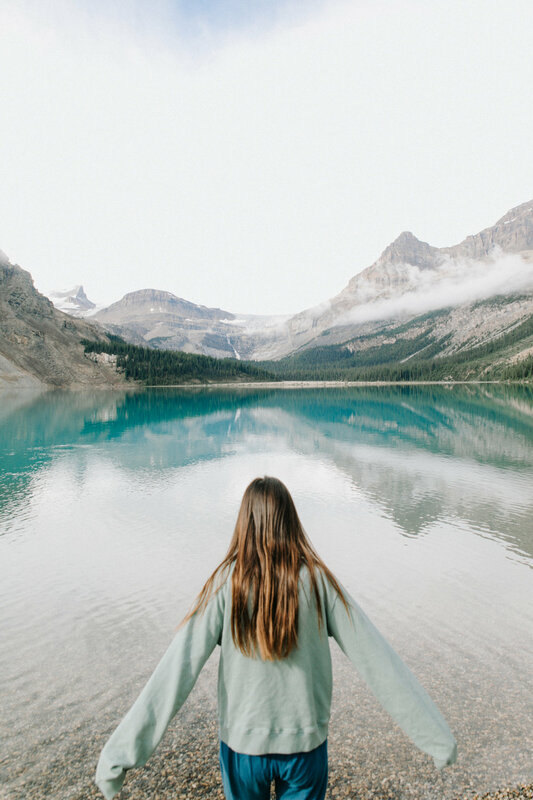 Last week we just got back from our fun trip to Banff National Park and wanted to share some useful tips for people that are thinking of going to explore this beautiful National Park! We’re going to talk a little about places we stayed, sites we visited, and thing we wish we would’ve known before we went. Before we get into this, we’d love to give a little shout out to Glamping Hub and Simpson’s Num-Ti-Jah Lodge who provided us with a super fun place to stay right on Bow Lake situated in the heart of Banff National Park. If you’re looking to stay in Banff and want to wake up to an amazing view you’ve go to check them out. Plus, if you’re going anywhere you need to check out Glamping Hub because they have some of the coolest places to stay in Nature while not breaking the bank. Here is a link highlighting some of “Best Camping Cabins in the US”. The view just a 2 minute walk outside the lodge! This beautiful lake and if you look closely there is a beautiful waterfall flowing down! The view from Lodge! Incredible!! 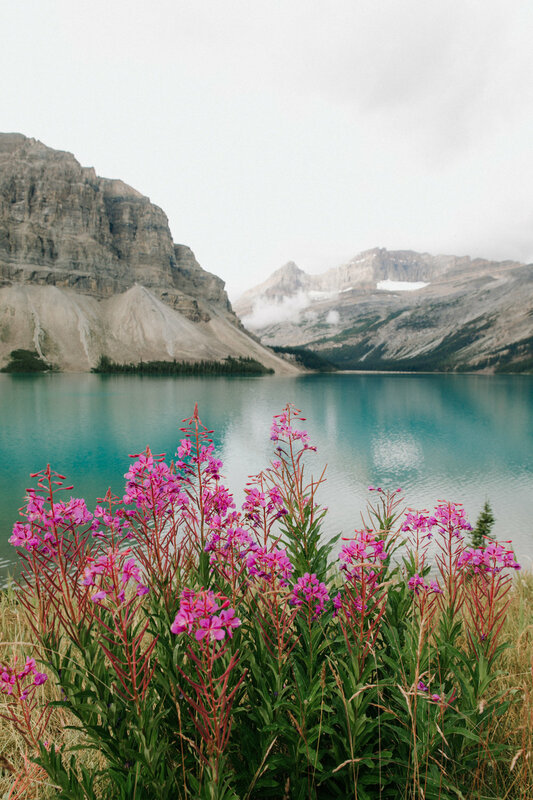 The wildflowers are so pretty up at Bow Lake in August! So planning ahead is a good idea because Banff is a super popular place in the summer. If you are planning on camping, there are campsites you can reserve or campsites that are first-come first-serve. We went to the Parks Canada website to figure it out. On the website there is a helpful chart that shows which campsites are reserved ones and which ones are first-come first-serve ones. We ended up just showing up and realized that most of the camping spots were filled up. When we drove up to one of the camp rangers and asked him what he’d recommend, since we were at Lake Louise, he recommended us driving to the Protection Mountain campsite and seeing if we could find an open spot there. He also gave us a tip that sometimes there isn’t any open spots but you can see if there are some campers willing to share a spot in exchange for splitting the camping fee. Sometimes the campsites are large and campers don’t mind sharing a spot. The Num Ti Jah Lodge is nestled in the mountains! So cute!! If you’re not into roughing it there are some really nice places to stay throughout the park. The spot we stayed through Glamping Hub (Simpson’s Num-Ti-Jah Lodge) was a really fun way to end the trip because it was situated a little away from the really busy lakes but still in a beautiful location right by Bow Lake with some fun hiking to a waterfall. The Lodge was a cozy cabin and the perfect place to relax while enjoying the natural beauty of the park. By the way, the lodge up there had Bison Chili. Ya, we were a little skeptical at first but it was well worth the 8 Canadian dollars. Banff has so many hike, lakes, and waterfalls that it can be overwhelming to know where to start. Lake Louise and Moraine are some of the most famous lakes and need to be visited early in the morning if you plan on getting a parking spot up by the lake. We got to our parking spots by 6:30am and lines were already forming. By 7am they were closing the parking lot because it was so full and wouldn’t open it back up until 6 or 7pm in the afternoon. Not sure if it’s always this busy but it’s good to be there early if you want to get parking. We never did this but I guess there’s a shuttle service (I think it’s free) that shuttles people up to Lake Louise. Both of these lake were super cold and super beautiful. You can’t help thinking that the whole lake is a giant puddle of Blue Kool-Aid. Another beautiful lake we went to was peyto Lake! This lake has an awesome view from up above another Blue kool Aid lake with only 30 minutes hiking or less to get to a good lookout spot away from the crowds! If you’re looking for a hike full of beautiful waterfalls you need to check out Johnston’s Canyon. It took us about two hours to do the whole thing and we did stopped to film and stuff along the way! The whole hike is paved and we saw a lot of families with little kids doing the hike. The last waterfall on the hike! There were so many waterfalls in Johnston's Canyon! Emerald Lake. Crazy boy just jumps right in! One of our favorite lakes was Emerald Lake. This lake is smaller than Lake Louise and Moraine but still is that magical blue color. Plus, when we went it was the warmest of all the lakes(still freezing tho haha) and there were quite a few people jumping off a bridge and swimming around in the lake. Fewer people are there and the canoe rentals are the cheapest at this lake if you want to rent a canoe. At Emerald Lake the canoe rentals were $60 per hour, Lake Louise it was $90 per half hour, and at Lake Moraine it was $90 per hour. We ended up taking our canoe tour at Lake Moraine only because we didn’t know what Emerald Lake was like. Kayaking this lake was the highlight of the trip!! If you’re like us and always looking for ways to save a buck here are a few tricks we learned. We usually use the app Turo to get rental cars and were lucky when the rental car we got in Calgary came with a Canadian National Park pass. If you are on the Turo app looking for rental car options it might be worth your time to ask car owners if they have a park pass available. If they rent the car to a lot of people visiting Banff there is a good chance they have a pass and can let you use it while you are renting the car. Stock up at Costco if possible :) We made a quick pit stop at Costco before heading up to the park and were so so happy we did! The food at the park is a little more expensive and it’s just nice to have a ton a fruit, water bottles and granola bars in the car if you get stuck in a long line of cars waiting for a parking spot. Funnest boy to travel with! Cold nights in Canada. We went in the summer and were pretty lucky with having warms nights but one of the nights we were there was pretty cold and we were really glad we purchased some warm sleeping bags in Calgary right before we went. During the days we usually wore shorts and t-shirts but in the early mornings and evenings we were glad we had some warm sweaters. Taking fun pictures. While you’re there you’ll find yourself pulling out your camera all the time to snap another picture because everything looks so out of this world amazing. If you’re looking to get pictures of the lakes super flat and glassy we’d suggest to go early (like 6:30 am). Usually the lakes were really glassy and pretty at this time. If you end up missing the morning shots you can go in the evening and get some really amazing shots as well. The morning might be a little bit better but on a good day it’s hard to know if there’s a difference. The view from Peyto Lake! what a sight!! Overall Banff is a must see! If you like hiking, exploring, and taking pictures it’s a guaranteed good time. We hope this little summary of our time there with places we stayed, sites we visited, and some tips we learned while there can make your future trip there even better!